A campaign to give young people the confidence to raise road safety concerns with their peers has been recognised with a national award. 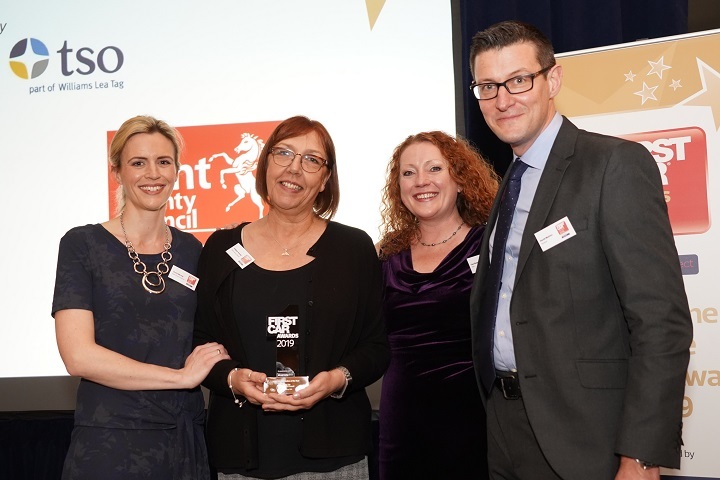 Kent County Council’s ‘Speak Out’ campaign was named best road safety initiative at the 2019 FirstCar Awards, held at the Royal Automobile Club in Pall Mall on 6 February. The FirstCar Awards – which are separate to the FirstCar Young Driver Road Safety Awards – were established in 2018 to reward organisations who ‘lead the way’ for young drivers. Launched in 2017 on the back of figures showing car occupants aged 16-24 years accounted for 23% of all fatal and serious road casualties in Kent, Speak Out is a multi-channel campaign featuring films of real friends talking about friendship and trust. The films are designed to give young people the confidence to ‘Speak Out’ when they feel unsafe while travelling in a car with peers, by providing them with ‘pre-programmed coping strategies’. The 2019 First Car Awards comprised a total of 17 categories covering ‘everything from apps to finance’. Click here to see the full list of winners. For the second year in succession, the Nissan Micra was named ‘new car of the year’, while the Volkswagen Polo was crowned ‘safe car of the year’. David Motton, FirstCar’s editor and chairman of the judging panel, said: “We’re delighted that Nissan has made big-car safety features like autonomous emergency braking standard on the Micra.